Nothing is more annoying than earphone that don't fit properly. If they are too loose, they fall out. If they are too tight, they cause ear pain. Who wants to deal with all of that? We've created Bonetech Earphones to combat those problems as well as many others associated with wearing headphones. Are you sick of your earphones getting dirty from being inside of your ear? This can actually cause infection and result in long-term hearing loss! Bonetech Earphones are designed to sit outside of your ear. There are bone conductive earphones that don't go inside of your ear canal. The vibrations of what you're listening to transmit sound waves directly to the cochlea. This is SAFER than other invasive earphones or buds. Our earphones allow you to talk to friends and family without blocking your ears, listen to music, enjoy long phone calls, and fully pay attention while driving or walking. Bone Conducting Technology: Our Bluetooth headphones use bone conduction technology to transmit sound waves to your cochlea. This protects your ear drum from infections, dirt, and damages associated with invasive earphones or buds. 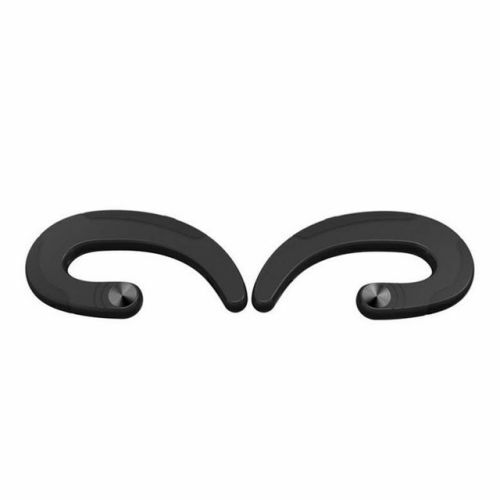 The ergonomic C-shape design sits comfortably around your ear and never falls off. Bluetooth V4.2 Multipoint Connection: The earphones quickly pair with smartphones, tablets, and other Bluetooth-enabled electronics. Simply push one button and you'll be taking calls, listening to music...whatever you want! We make it all hands-free for your safety. Built-In HD Microphone: Easily switch between voice call and music. Easily switch between voice calls and listening to music! Our built-in microphone has a signal range of up to 33 feet. You'll always experience crystal clear sound. Great for in the car or at work. Long-Lasting Battery: Built-in high-performance rechargeable Lithium-polymer 180 mAh battery. Comes with a silicone tension band. Allows up to 6 hours of music time and 8 hours of talk time. Easy To Operate -After Bluetooth connection is setup, simply press the right button to answer a call or play music.